As part of the time4tots.org drive Gannon & Gannon Language School will be holding the first English Immersion camp this year at the Hotel Bojur in Bansko. The hotel is Situated in the heart of the town, the most famous and up-to-date Bulgarian mountain resort in the Pirin Mountain, 150 km. south of Sofia and very close to the National Park Pirin. This year’s event will take place from July 1st thru July 8th 2009. During the camp the children will be learning and practicing the English language through standard lessons and by participating in enjoyable activities. 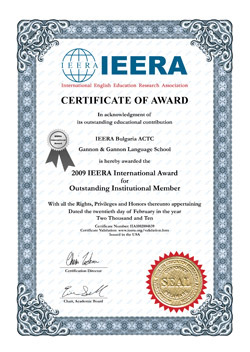 In March 2009, Gannon & Gannon Language School signed a partnership agreement with The IEERA for providing TESOL training and Certification in Sofia, Bulgaria. The IEERA (ieera.org) a global education research association, has approximately 5 million members in over 120 countries. Its mission is to ensure excellence in English language teaching. IEERA values professionalism in language education; individual language rights; accessible, high quality education; collaboration in a global community; interaction of research and reflective practice for educational improvement; and respect for diversity and multiculturalism. Gannon & Gannon language school is starting a drive to assist local schools improve their language programs for the children attending classes. Time will be donated weekly to help students better understand the languages they are studying in school. And we would like to invite everyone who has time to help in their own local communities.